The lovelingly managed Hotel Villa Steno features great view balconies, private gardens off some rooms, air-conditioning, and the friendly help of English-speaking Matteo. Of his 16 rooms, 12 have view balconies, includes hearty buffet breakfast. 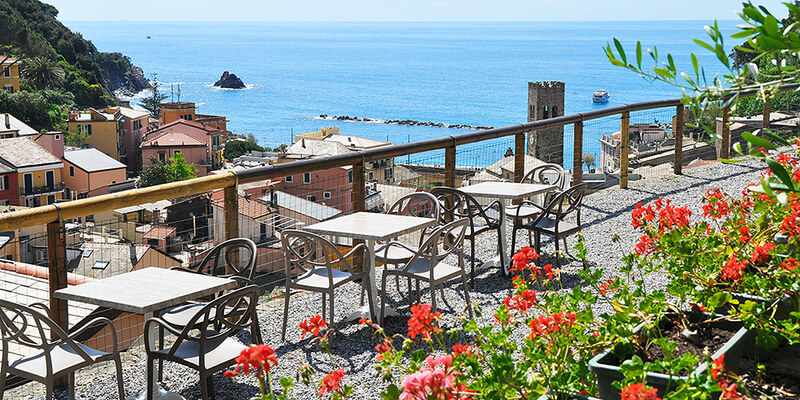 Readers get a free Cinque Terre packet and a glass of the local sweet wine, sciacchetrà, when they check in-ask. The Steno has a tiny parking lot (free, but call to reserve a spot). 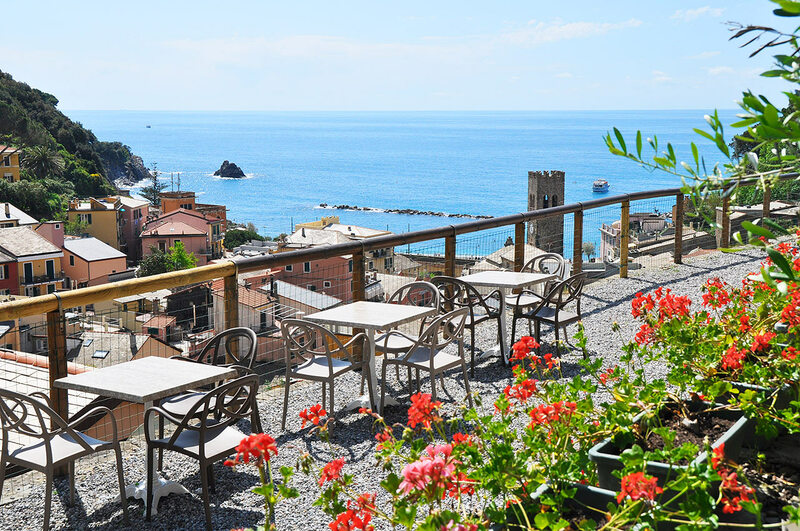 Constantly in search of places to stay in the increasingly popular Cinque Terre, we were pleased to receive a letter from one of our readers highly praising the Hotel Villa Steno and its gracious owners, Matteo and Carla. We are pleased to confirm her impressions of Villa Steno, a simple yet most appealing small, family run hotel with a tranquil location just above Monterosso. An enormous advantage is that it offers parking for guests (space is not guaranteed, but usually available). The hotel, an attractive, mustard-yellow villa accented by green shutters, offers guests a warm welcome. Usually Matteo, or his sweet wife, Carla, is at the reception desk to greet you (you might also catch a glimpse of their adorable daughter, Chiara). The heart of the hotel is the breakfast room where there is also a small guest sitting area. Here modern furnishing made of blond wood and sunlight streaming in through large windows create a pleasing mood. A hearty buffet breakfast includes fantastic pastries baked fresh each morning by Matteo's father. The guestrooms are simply furnished, but fresh and impeccably clean. Each of the bedrooms has a private bathroom, almost all of sthem with a shower enclosed by a wraparound curtain. Except for two, all of the guestrooms have either a balcony or a private terrace. Matteo's brother, Marco, owns another hotel, the Pasquale, located in the center of the village. Both hotels were started by their enterprising grandfather, Pasquale, and his wife, Fortunata. This is the hotel we prefer most in the Cinque Terre. Unpretentions, it offers comfortably appointed guest rooms with a minimalism look and bright white walls. In addition, each room has a private terrace or small garden.